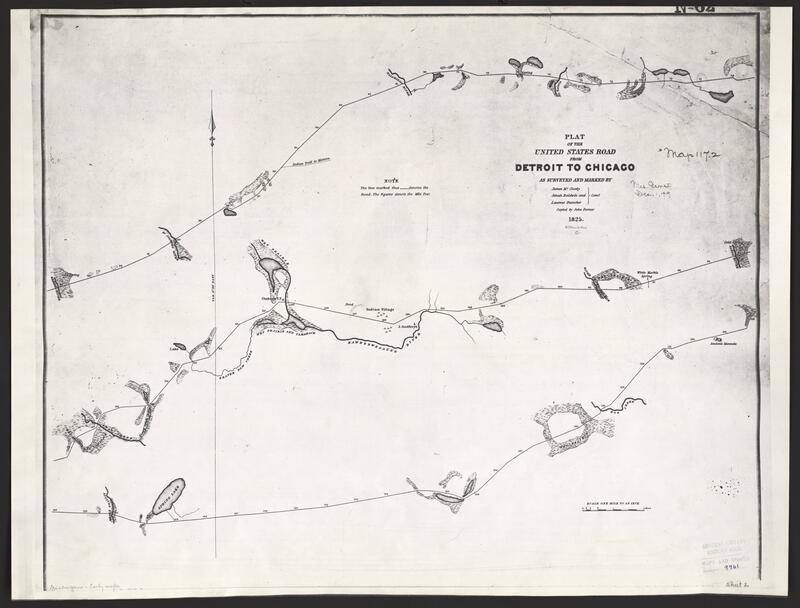 Plat of the United States road from Detroit to Chicago; as surveyed and marked by James McClosky, Jonah Baldwin and Laureat Durocher, commissioners; copied by John Farmer. McClosky, James.,Baldwin, Jonah.,Durocher, Laureat.,Farmer, John, 1798-1859.,United States. War Department. Engineer Bureau. Shows rivers, lakes, and Native American villages. 11 sections on 4 sheets; sheets 48 x 64 cm This map is in the public domain. Please attribute access and use of this digitized map to the Stephen S. Clark Library, University of Michigan Library.